SnowVentures: A Bear In Downtown Breckenridge! Last Thursday while driving home from the office, I noticed a large crowd in front of the Barney Ford Museum in downtown Breck. People were pointing and taking pictures, so of course I had to stop and see what the commotion was all about. 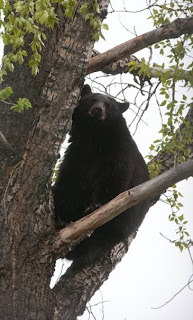 It was a small black bear that wondered into town looking for food. He was chased down Main Street and found refuge in a tree. 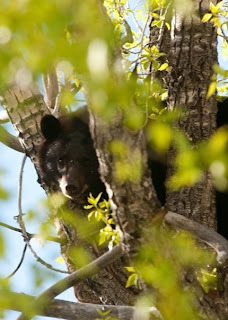 Living in the mountains, locals are used to seeing bears but not on Main Street!